Spirit Warriors: The Lamenting is book #4 in this series of YA native American reads. They are set in Montana. At the beginning of this book there is a short introduction to the main characters and a hint of the story so far, which is a good reminder to anyone picking up the book who already knows the series. To get the best experience from this read I think you need to start the series with book 1 and work your way through. The lead character is seventeen year old Emme, she and her teenager friends have special powers which allow them to unite with wild animals and make them spirit warriors. They are haunted by the deeds of the evil Machayiwiw (a native Indian spirit turned bad) who is intent on causing havoc and destroying Emme and her loved ones. The book opens with a dual tragedy, Emme’s father and two close friends have recently died in a house fire and Emme and Charlie are recovering from an attack by the Machayiwiw. Charlie’s human spirit is still in Hercules a grizzly bear, but his body is in hospital, time is running out for Charlie unless they can reunite them. Throughout the series Emme is torn between her love for Charlie whom she’s known since childhood and her new love for Jack who she intends to marry. The inevitable love triangle causes frictions within the group. There is a lot of responsibility on the young shoulders of Emme as seen by the many sub-plots as the time for the final showdown with the Machayiwiw draws ever closer. The story continues in Book #5. The Burning is book #3 of The Spirit Warriors #YA series, set in Montana around a group of teenagers and their connections to animal spirits revered by the Native Americans. The evil spirit of a once powerful medicine man known as the Machayiwiw is hunting narrator, Emme . She is a powerful descendant of Golden Flower, an Indian girl whose spirit is currently trapped inside a vulture. Emme and her friends Charlie, Ollie and Bets are spirit warriors called to face a big battle against this evil spirit. They are being taught the skills they need, and are helped via visions, from the ancient Indian chiefs they are building knowledge of the Machayiwiw. During their preparations they must face other domestic dramas, Emme’s family are falling apart and she’s also finding where her future lies in her own love triangle. This book is a building of the storylines, adding background depth, I thought there was going to be much more action with the Machayiwiw. I really enjoyed all the spirits and stories from the ancient tribesmen. However at times I felt some of the dialogue was too stiff and a little unrealistic. Roll on book #4. This review is based on a free copy of the book given to me by the author. I live in Lufkin, Texas, affectionately known as being “behind the pine curtain.” This area of Texas has huge towering pine trees, gets lots of rain, and an occasional hurricane! Remind me again why I live here! Ha Ha. Really, it is a quiet, picturesque town with some of the best people you would ever like to meet. I was raised in Eastern Montana where the cattle outnumber the people! I started writing romance about two years ago. I have loved romance stories for many years. My grandmother read Harlequin romance books and when she was done, she gave them to me by the sack full. My mother was appalled and called them trashy, smutty books! I was a teenager then and excited at the prospect of reading a trashy book. I quickly learned that Harlequin romances were the least trashy of all, but I never told my mother that! My favourite sub-genre of romance would be young adult or new adult. I like the innocence of first love and everything that goes with it. First love is felt so acutely and passionately, and remembered forever. Spirit Warriors is a YA fantasy series about five friends, who by no coincidence, are brought together to fight an evil spirit who has plagued a Native American tribe for centuries. Emme, who narrates the story, has a battle within her heart. Will it be Charlie, her first forbidden love, or Jack, who sets her blood on fire? It’s a story of the power of friendship, and love, even in the midst of loss. What special talents do the teenagers in this book have? Cool ones! They can shift their spirits into their chosen animals. Charlie into Hercules the Grizzly bear, Emme into Eros the osprey, Bets into Electra the mountain lion, Ollie into Zephyr the coyote, and Lilly into Arion, the wild mustang horse. Who or what are they fighting? They are fighting the machayiwiw. He is an evil spirit that has plagued Charlie’s tribe for centuries, exacting revenge for something that happened hundreds of years ago. The romance is a sweet love triangle tell us about the characters involved. Emme, the narrator, grew up with Charlie. He is her protector, having left his tribe at a young age to be with her. Charlie is her first love, but the Spirit Warriors who guide Charlie have told him in no uncertain terms that Emme is not his true love. So, is it Jack? He is Charlie’s best friend, who moved back to the family ranch from Australia. Emme feels protected and loved with Charlie, but she can’t deny the spark of fire between her and Jack. Book 3, The Burning finally answers the question! Teaser alert! Book 4, The Lamenting has a huge wedding in it! Are there any other romantic attachments running through your series? The other friends, Ollie and Bets also have love interests. Ollie comes out to his friends about his sexual orientation and he has a boyfriend, Raymond. In The Burning, they work to stay together as high school ends and college looms. Bets has a boyfriend, Joe, who none of the other friends like. In fact, Emme, threatens to kill him if he ever hurts Bets! Too many things! Book 4 in the Spirit Warrior Series, The Lamenting is in editing, and I have started on the final book, The Ensouling. I am writing a couple of romance stories that I am working on when I get creative burn out! They probably won’t be out until I finish the Spirit Warriors series. Just about anywhere. I have social media covered! Here are the links. October 26th – Posted a guest author piece for new author Mark Giglio. http://wp.me/p2Eu3u-5UF Spent all day getting lost in Moscow Bound by Adrian Churchward a mystery set in Moscow and very good. October 29th – Walked into town and picked up litter on both legs of my journey. October 30th – There are big celebrations of the war veterans this year with the anniversary of the start of WWI. The annual Poppy appeal is getting extra support and I bought my own poppy today and gave to the poppy appeal charity. October 31st – Cleared leaves from a shared pathway and spent a little time out in the warm autumn afternoon. Gearing up for the start of the mystery November book tour tomorrow. November 1st – Mystery November is off with Joanne Phillips and her book Murder at the Maples. http://wp.me/p2Eu3u-5OZ We have this awesome imaginary tour bus covered in my orange roses going all over the world each day to pick up the tour authors. Overnight Saturday I magically drove from the UK to Texas making sure I didn’t fall asleep and end up on the Grand Prix race track in Austin. The bus is picking up Della Connor for Sunday’s book Spirit Warriors: The Scarring. August 10th – Have been drafting up Romancing September posts, and a book review post. Had a lovely chat to the student who served me at the supermarket till about his new course he’ll soon be starting at University, made time to be interested in what he had to say. August 11th – I’ve been spending my Amazon vouchers on books! Some for me and others to share with family and friends. I’ve read some great books in e-format which I would like to share with others, so today I bought Saving our Pennys and The Singing Bowl by Roy Dimond in paperback. I’m also looking forward to re-reading them. Both books really impressed me and got me thinking about life and I wanted to share them with others. Augustt 12th – It’s been a hard day today, I posted my 3* review of a book for an author who took offence, ( 3* stars! I said there were parts I liked! Get a reality check) I have already put up with a rude e-mail and he has added a vile comment on Goodreads to my review. He posted a equally bullying comment on my blog which I removed. My review stays because I will not bow down to an author who behaves this badly. My book review policy clearly states “I’ll never try to degrade an author or their hard work, but we all have our own tastes, so please RESPECT MINE. Should you dislike my review, then we will have to agree to disagree. Any further ranting about it especially on any of my social sites will not help your cause.” Not clear enough for some people it would seem. The kindness challenge has gone out of the window today and the charity box is firmly closed, I will not pay out my money in this situation, sorry, I will try harder tomorrow. Good Deeds received ; Thank you everyone for you support at this trying time. I’m pleased to say it hasn’t put me off reviewing, I have sent of a review for a lovely YA book Spirit Warriors; The Scarring by Della Connor. As you know I do like a book that has a bit of ghosts and spiritual connections, so this book was right up my street. I have also taken on 3 more books for review today. Good deeds received: An apology from the author who had his temper tantrum of my 3* review. August 14th – Have nearly finished all 30 drafts for the Romancing September Tour. Downloaded a free book from Author Rae Rivers who will be one of our guests on the tour, a quick prequel to her series, The Keepers: Sienna. Sent my youngest child out on a play date with chocolate cakes to share. August 15th – A couple of friends birthdays today so we are off to deliver presents and best wishes. Wished another friends son good luck with his driving theory test tomorrow. My oldest is learning to drive too and so are many of her friends, its all the next step in growing up. A bit scary though, sitting in the passenger seat and not being in control of the car while she learns. August 16th – Started a good tidy up of the house and garden, to help reflect the need to tidy up my life. Started reading Patriot by A.S Bond ready for a book review. Drafted up a couple more posts for later in the month. August 5th – Made sure I wished a friend’s son good luck with his driving test today. August 6th – Took my son and a friend to the park to play cricket and picked up litter. Checked several friends had remembered we are going out for a meal tonight. Good deeds received: Being picked up tonight, so I don’t have to drive. August 7th – Sent a return letter to the above aunt booking us in for a visit in September, she likes to keep with tradition and use pen and paper to communicate mostly, although she has a new laptop which she’s having trouble getting used to, so hopefully the kids can give her a hand if we can’t help her. August 8th – Agreed to read and review a book by Gina Henning that is due out next week, although my review won’t be ready that quickly. Off out for tea with friends this afternoon. Taking them books to read. August 9th – Sent off my review for Lost Souls. Out to tea at the in-laws this afternoon. Picked up litter. Began reading the second book in the Spirit Warriors series by Della Connor. Have been drafting up more Romancing September posts. Received my windfall of Amazon vouchers and have already purchased Bending the Boyne by J.S Dunn, a historical book about Ireland that I’ve been wanting to read for a while. Let’s Find out more about Della. My hometown is Lufkin, Texas about 100 miles north of Houston, Texas. It is a small town surrounded by towering pine trees. Hotter than Hades in the summer, wonderful in the winter! I have been writing something all my life. I have stories that run constantly through my mind. I just don’t have the time I need to write them all down. I finally stopped writing on bits of paper and actually wrote them down on the computer. That action started the Spirit Warriors Series. 3) What was the best bit about growing up on a farm in Montana? Well at the time I thought nothing was good about it. I was a typical teenager, ready to get the hell out of there and live in a big city. Now looking back at it, I miss the summers. I miss the smell of warm alfalfa grass and wildflowers, the cool breezes, the turquoise blue of the Montana skies. I miss riding horseback on my pony Silver and lying on my back watching the clouds in the sky. I learned the value of hard work and the love for land and animals in the beauty of Montana. 4) What was the worst bit? The winters! They last forever. The sun is gone by 4:00 in the afternoon. It seems to be dark more of the day than it is light. Recently, my parents had a temperature of -30 degrees at the ranch. I don’t miss Montana then. 5) Tell us about the Native Americans who lived in Montana. The Native Americans in Montana are of varied tribes. In the part of Montana that I was raised, they include the Northern Cheyenne, the Sioux, the Crow, and the Flatheads. Each tribe is distinct with their cultural practices. The tribe in my book is not a particular Native American tribe but rather a fictional tribe based on several tribes practices and beliefs. 6) Can you tell the readers who or what the Machayiwiw was? He is an evil spirit who has been around for centuries. He was once a powerful medicine man and took the path of power and hatred. He has a huge score to settle with this tribe and he will not stop until it is completed. 7) I’m from the UK can you explain the type of Rodeo racing that Lilly took part in. She was a barrel racer. It is a competition for women, based on the speed of the horse and rider completing an obstacle course of 3 barrels. The horses are specially trained to take tight corners around the barrels with great speed. It is very exciting to watch. Rodeos here include several events for the ladies, including barrel racing, goat tying, and pole riding. The men ride the bucking horses and bulls, and calf rope. 8) I loved the emotion in the writing, how much work did it take to get right? Oh my gosh! So much work! I always think it is perfect until my wonderful editor gets a hold of it. She tells me, “We are not mind readers. We don’t live the world in your brain. Spell it out.” I just wish I could let everyone into the world in my mind. It would be easier than trying to write it down. The characters are all there playing over and over like a movie. I just eavesdrop in their world. 9) The Spirit Warriors begs for a second in the series, are you writing one? It is already written and in editing right now. It will be called Spirit Warriors:The Scarring. It will take off from where we left the kids. This book includes the history of the machayiwiw and more insight into the personalities of the kids, especially Bets. Did you notice the first book had Lilly and Arion on the cover? The second book will have Bets and Electra on the cover. Jack walked back to the mangled bodies. He stood there with his head bowed and his hands folded. I knew he was worried for us. We were killers. Charlie, Ollie, Bets, and I had each killed. It didn’t matter that they would have killed us. What mattered was that we were killers. That was the first time I had ever felt a tiny part of my humanity die. It wasn’t a nice feeling. 10) Do you have an expected publication date? April or May 2014! Sooner if I can get through editing. Thank you Rosie, for the interview and review of my book Spirit Warriors: The Concealing. You rock my world! Thank you Della, it’s been great hearing more about your work. 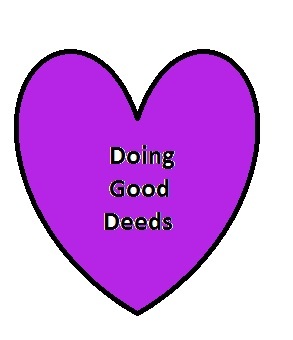 I’m now in to my ninth month of my year of Good Deeds challenge, where I try to do at least one Good Deed a day and I write about them. I find that, for me, this brings their value to the forefront of my thoughts. My inspiration came from reading “A Year of Doing Good” by Judith O’Reilly. Let’s catch up with my Good deeds for the week. Sunday 12th – A low profile day today and just 2 book review posts sent out. Monday 13th – My Good Deed morning at school volunteering didn’t go as planned. I was interrupted by 3 phone calls, now I don’t like to answer my phone in school it’s rude, but since I updated my phone on Saturday the thing hasn’t stopped ringing. (The reason I needed an update being that I got little reception with the old one because it was nearly conked out, I used to have a quiet life, sigh!) Hubby needed me to cut my morning short and race home to sign for a parcel. Then a “Lovely man” from HMRC (Her Majesty’s Customs and Revenue) wanted to arrange a telephone appointment with me to check on my Money Laundering procedures. (Don’t ask! And No! I’m not printing money! It’s because I do a little book keeping.) Agreed he could ring me Wednesday, well I couldn’t actually refuse! Posted another book review for Della Connor and her book Spirit Warriors. I’ll be reviewing this on the blog early February along with a lovely guest author post and your chance to win a copy of the book too. Tuesday 14th- A work morning and I did more than was required because when I spoke to my colleague last evening she was still at work way after her going home time because she had so much to do. (She sounded more stressed than I was. Is that the phone again?) The phone’s ringing again! One of the partners at work rang me twice (Ha! Bad reception and he got cut off) trying to find some paperwork that I’d tidied away, fortunately (Good Deed) I remembered where I’d put it. The parcel I signed for yesterday turned out to be only one quarter of the full delivery, the parcel tracking service claims it was delivered last Thursday, but to where? Husband set off knocking on doors around the estate last evening to no avail. Then today a lady kindly knocked on our door with a complicated tale about the missing parcels, but we’re still not sure where they are. I’d go and collect the parcels if we knew which house they’d got to. Good Deeds received, plenty of Good luck wishes for my telephone audit tomorrow, it’s not enjoyable being questioned by Government officials. Wednesday 15th – Phew! Passed my MLR audit. Have just Okey the proof of February’s edition of my Rosie’s Good Reads for Fleet Life, I always get excited seeing my work in print. 5 more author’s get a bit more publicity, I’ll blog about them when the paper copy arrives through my door in a couple more weeks. finished reading The Dating Game by Susan Buchanan, drafting a post for early February. Friday 17th – Posted another book review on Goodreads and Amazon for a book which looks like it splits the readers into those that love it and those that hate it. I’ll be posting my own review of Prince of Wolves by Quinn Loftis here on the blog in mid February. Left a tip for my hairdresser in thanks, after she had tamed my wild locks. Saturday 18th – Made a donation to Helping the Heroes, a UK Military Charity whilst I was in Aldershot, Home of the British Army. Then headed home to do a bit more reading.